In completing your Open Water certification you earned your passport to the underwater world. But if you're like most diver you realize that you've only just begun. It's great having a Divemaster to help you navigate and point our things for you to see and do, but wouldn't it be great to be able to more confidently take charge of your diving? That is what the PADI Advanced Open Water program is all about; Build Skill; Gain Confidence. The course ricing includes course materials, instruction over 5 dives on 2 days and certification fees. The diver is responsible for providing all gear, transportation, park fees and air fills. To Register - Three Steps - and call Dive Connections at 434-964-9200 if you have any questions. 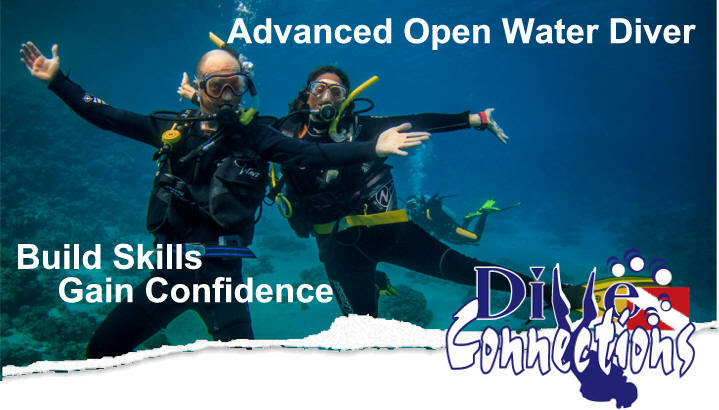 (1) Advancd Open Water Diver Course - Just deposit the course to reserve your spot. The balance is due at the orientation of the class. (3) Review the Medical Statement - Once we receive your deposit we will be sending you a medical statement and liability releases for your completion. Please just fill them out and return them as requested. If you are wondering about how scuba diving can affect your health, here is a link to a medical release and information. It’s always a good idea to have a physician advise you when you are planning a new activity. What dives will you be doing? In this class you will have a little reading to do, but this is about diving and doing things underwater with you newly acquired scuba skills. You'll be doing the first dive on five different specialty diver courses. The final determination of what dives you will be doing will be up to you and your instructor as appropriate to your diving venue, but generally we suggest the following. Peak Buoyancy: The most important working skill in diving is buoyancy. Everything depends on you comfort and control in the water. Navigation: Knowing where you are and how to get back to your exit point certainly breeds confidence and comfort. It's good to find the boat! Wreck Diving: Wrecks are always inspire a sense of wonder and perhaps folly that all the dreams and ambitions of men often end up at the bottom making homes for the oceans creatures. Most wreck are teaming with life and make wonderful photo backgrounds. In learning to dive wrecks your are learning to observe the dive site carefully, a skill that adds enjoyment to every dive. Deep Diving: It' not necessary to dive deep to enjoy diving, but sometimes that something that you want to see is a bit beyond the depths that are appropriate for a basic Open Water Diver. It great to know the parameters that you must keep in mind when exceeding 60 feet so that you can do it in and informed and safe manner. Search & Recovery: When looking for something at a dive site, whether the object is recoverable or merely a point of interest, knowing search patterns and procedures can be very helpful. Recovering something is great, but moving it is all about managing your buoyancy and simultaneously that of the object. Very cool and very fun!